by domino - February 26th, 2015. 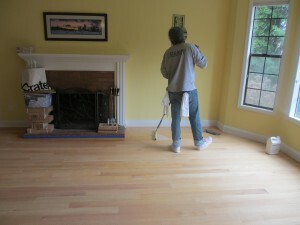 Filed under: oak hardwood flooring, portland hardwood floors. Tagged as: hardwood floors portland oregon, hardwood stairs. Bona has a finish that is anti-slip which we have used on stair treads and steps and I thought it would be a good idea to try it in our home on our stairs to see how it works. In one word: Amazing. We have wood stairs leading up to our second floor and this product is the real deal. In stocking feet you can feel the grip and I felt a lot more confident in walking down the stairs. I felt better about our dog, Mango, going down the stairs, also. On the Bona website they say that this product is “formulated to meet the highest standards for slip resistance.” It is GREENGUARD certified for indoor air quality, also. We also coated our sunken living room floor at the same time. 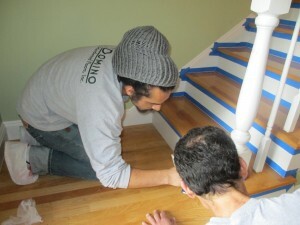 The finish looks the same, but if you run your hand along the stair or floor, you can feel a difference. We have friends that have older dogs, and I’m going to see how they do getting up off the floor with the added traction that the finish provides. I think this product is something that clients will like for their stairs for sure, and if there are small children or dogs that slip on the floor – this is the finish to use. 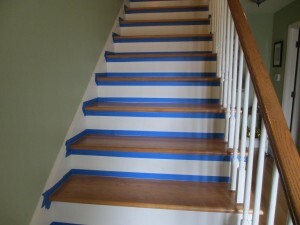 It took a couple of hours to prep (tape off the spindles and risers) and buff the stairs and coating was very quick. I was able to walk up the stairs at the end of the day in my stocking feet with no problem.